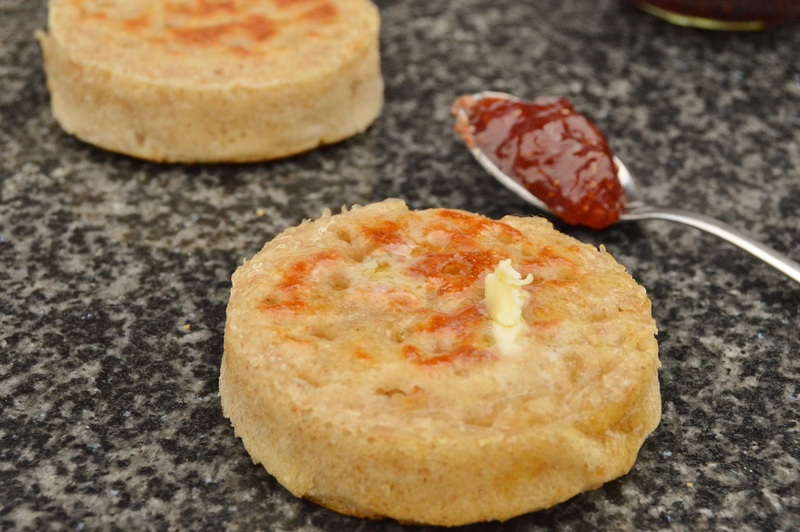 I am of the belief that a hot crumpet, slathered with butter, perhaps with some excellent quality jam, is one of life’s greatest foodie pleasures. 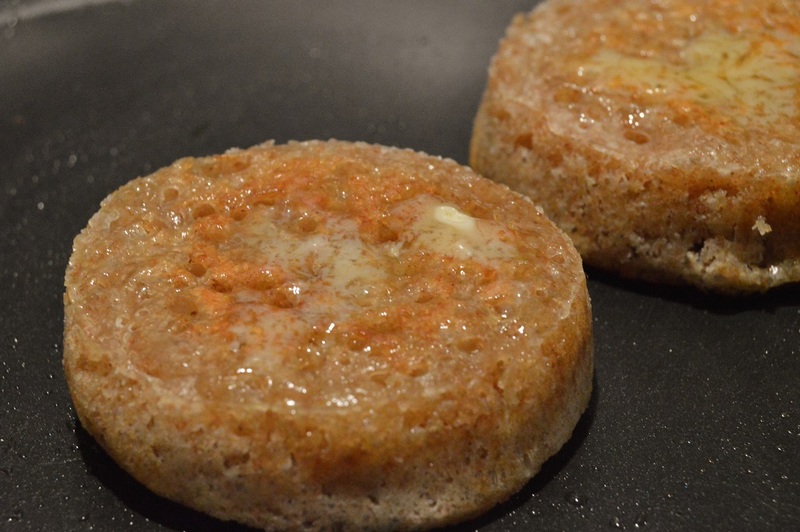 These are very simple crumpets, that are also relatively quick to make if you have an active sourdough starter: a batch can be made in about an hour. If you do not have a sourdough starter, I have given notes on using commercial yeast at the bottom of this post. I have gone for a wholemeal version here purely because for last couple of feedings that I gave my sourdough starter, I used a mixture of wholemeal flour and strong white flour. 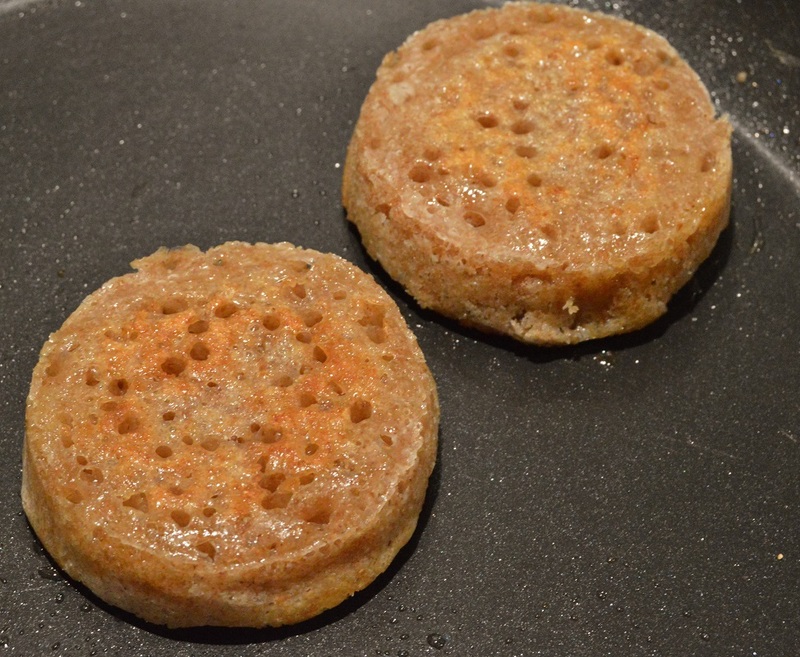 However, these crumpets work just as well if the starter is fed with white flour or even a touch of rye flour. 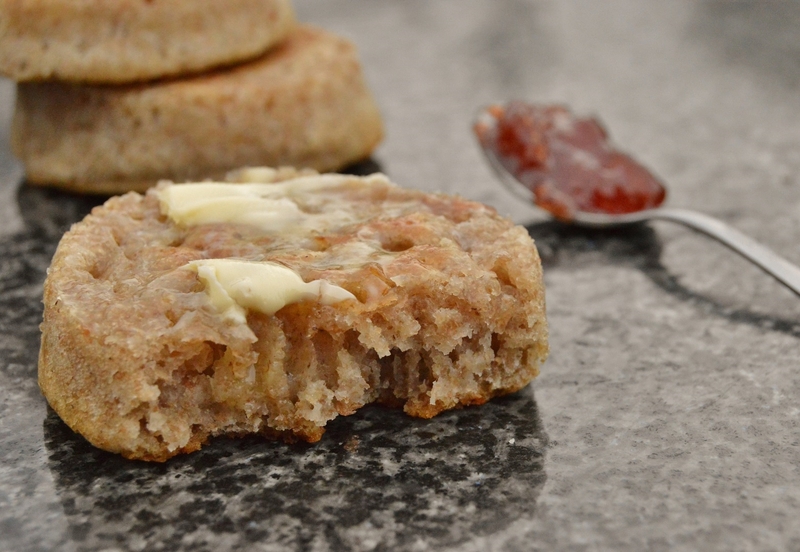 Despite these crumpets containing a fair proportion of wholemeal flour, they are very light, with the characteristic bounce you want in a crumpet, and are most certainly moreish! 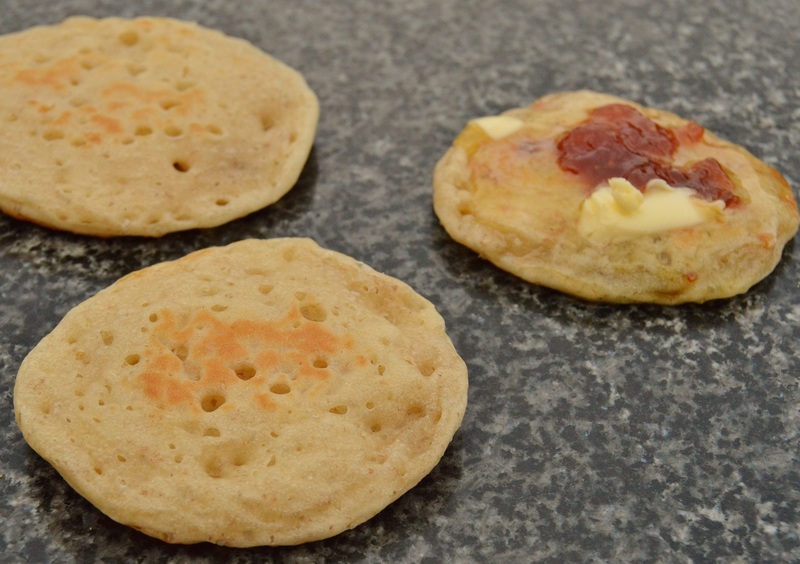 I have also included a few pictures of sourdough crumpets I have made using a starter that has been fed mostly with strong white flour rather than wholemeal. You need to use an active starter for best results here ie) one that has been fed with water and flour about a day earlier, rather than a starter that has not been fed for some time. For feeding I use an equal weight of flour and water, keeping it at 100% hydration. I tend to use 150g water and 150ml flour each time, with the flour component often being half wholemeal or rye flour and half strong white plain flour, although I sometimes increase the wholemeal flour if I am going to be using the starter for a more wholemeal feel to proceedings. 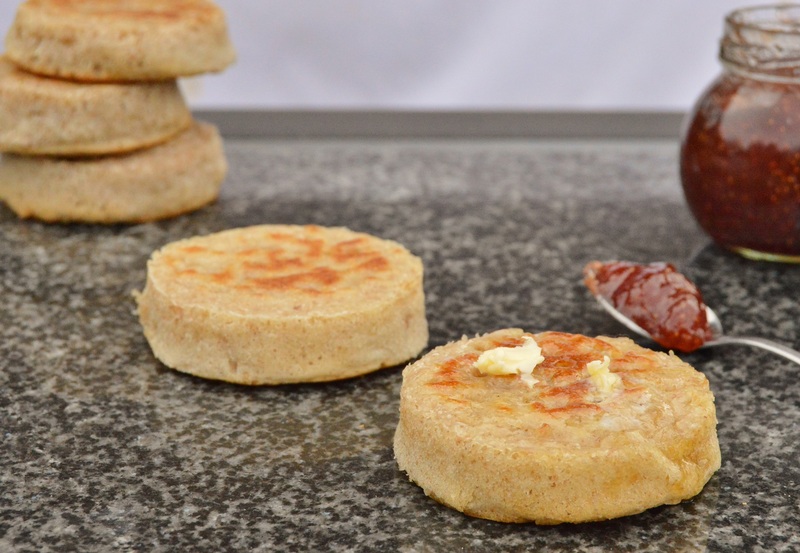 The starter is then very bubbly and raring to go for making a sourdough loaf or any variation, such as these crumpets. You can split your starter into several portions, keeping one for white starter, one for wholemeal or rye and the like, but having too many different starters can get very unwieldy to manage! When I have tried this, I have done well for a month or so and have then ended up neglecting one or other of them! 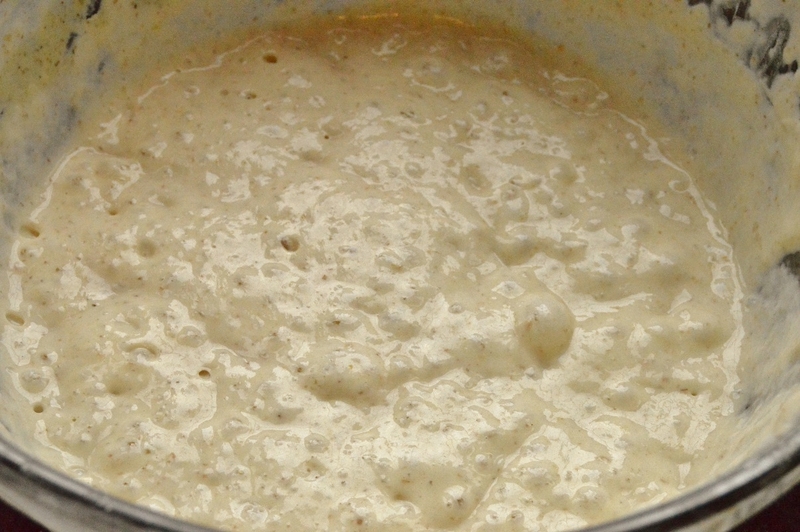 For guidelines on making and using a sourdough starter, please refer to my earlier post here. For perfect crumpets you need to cook the batter over a low heat, in a pan that has been preheated before you add the batter. 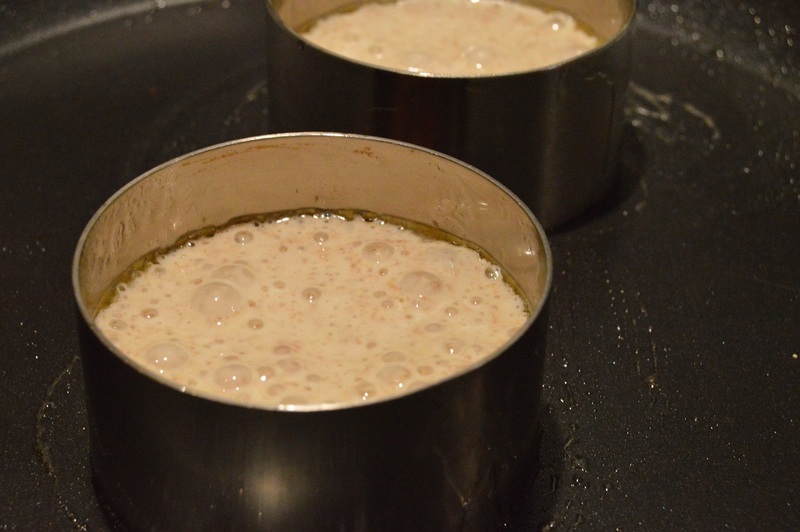 Using a low heat, there is little chance of the bases burning before the batter has had a chance to cook fully. Try to not disturb the rings or knock the pan until the tops have set. If you do, you might deflate the batter, resulting in doughy rather than airy crumpets. Any metal cooking rings will do but they do need to be generously buttered to prevent the crumpets sticking. I use 7cm diameter rings but you can of course use larger rings. If you do not have metal rings, just drop a tablespoon of the batter onto the hot frying pan or griddle pan and cook them free-form, essentially making pikelets. (1) Beat the starter, salt and sugar together in a bowl. Add the bicarbonate of soda and beat in well. Cover with clingfilm and leave in a warm place for about 30 minutes, after which time the batter will be very bubbly, owing to the bicarbonate of soda. NB: because the starter is very active, having been fed the day before, you do not need additional fermentation time here. The active starter will have bags of flavour, which is what you want with the crumpets. (2) Rub a little butter over a solid frying pan or flat griddle pan and heat gently for a few minutes. Butter metal cooking rings generously and place in the pan. Spoon the batter into each ring, coming to about half full. (3) Cook over a low heat for about 12-15 minutes until the surface has almost completely dried out. 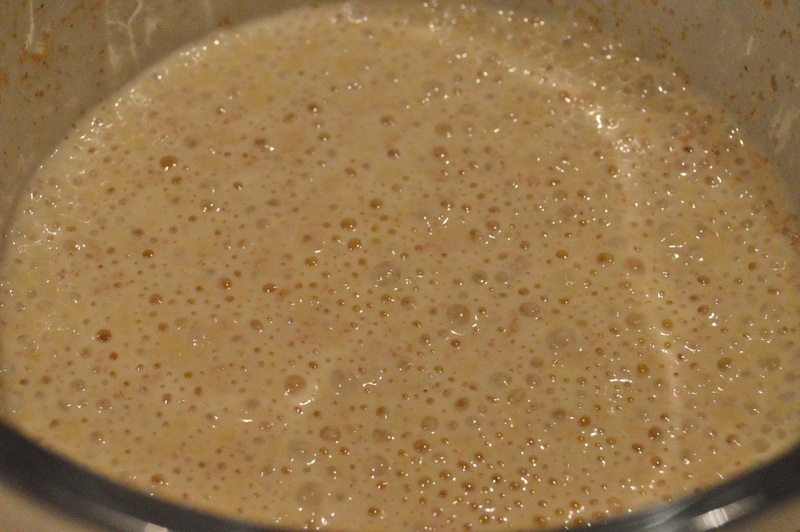 NB: after about 6 minutes, the batter will have risen somewhat and be very aerated, with several bubbles having popped, leaving the characteristic holes. (4) Turn the rings over and continue cooking for 3-4 more minutes: even if the surface of the crumpets is not touching the pan, the heat will be enough to allow the crumpets to take on a light golden tinge as well as making sure they are fully cooked through. Alternatively, remove the crumpets from the rings and place them top-side down in the pan to achieve this. (5) Serve either straight from the pan or, if eating them later, toasted – either way, you need plenty of butter and jam. 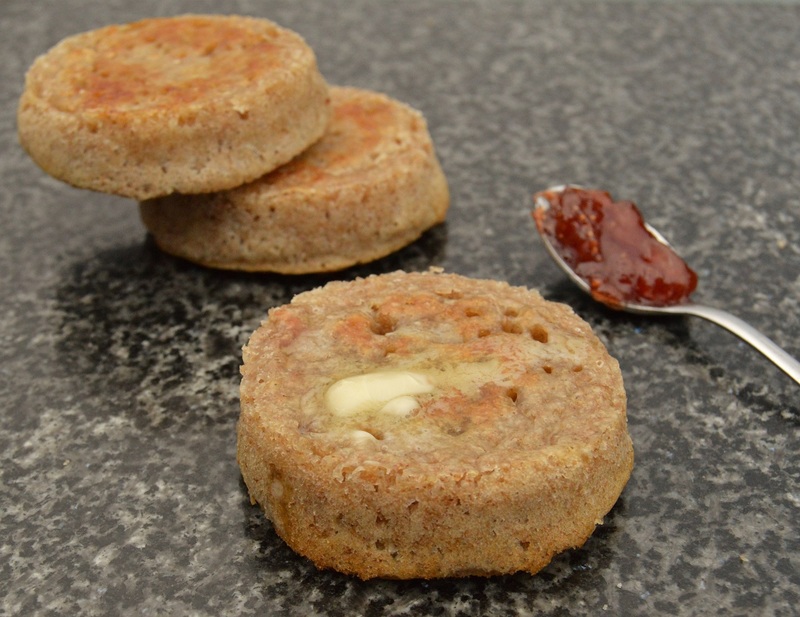 If you don’t have any sourdough starter, you can make these crumpets by instead using 150g strong plain flour, 150g standard plain flour and 7g easy-blend dried yeast mixed with the flours, salt and sugar. In which case, the batter only needs a couple of hours to rest and ferment initially before you add the bicarbonate of soda. oh yes do make a batch. There is sometime intensely satisfying about making them…and oh the joy when it comes to devouring them! !